Access your business communication when and how you want. The desktop feel of office email is now specifically designed for mobile business users. Keep work and personal separate without missing an email, invite, or task. Combine all of your must-haves. Easily access your mail, calendar, contacts, and tasks using a seamless experience. Stop wasting time fumbling between apps to look at your schedule before responding to an email – now you are just one click away. You have a life outside of the office. Enjoy your iOS device without the constant ping from work. When you are ready to connect with the office, quickly open Mail+ for your latest emails, invites, and tasks... on your schedule. Avoid the pinch-and-zoom experience of checking email in your browser. Instead of repeatedly entering passcodes or allowing your company to access your personal device, Mail+ can securely access your mail, calendar, and contacts. Easily view the emails and calendars of all your accounts within with just a few taps. Access to all of your email accounts in one place. Get instant notification of new emails or upcoming calendar appointments. View your emails or appointments on the plane, send emails, create new events, and when you are reconnected to a network all of your data syncs automatically. Mail+ is updated regularly with new features and frequent enhancements to the user interface making sure you have the best experience. Access your office email in one place. Manage all of your office needs on the go with the same features you use while at the office. Reply to emails with rich text, use scheduling assistant to find the best meeting time, or organize your calendar and tasks without switching apps. The interface is designed using familiar iOS mail solutions combined with Outlook on the desktop allowing you to focus on being productive without relearning how to manage your office email. Get access to all the features you are familiar with on Outlook for the desktop, redesigned for your mobile life. Create professional looking, easy-to-read emails straight from your iOS device. Differentiate your inline replies by changing font color, create bulleted or numbered lists, or change font options so your emails look like they came from your desktop. View your upcoming appointments on the go or quickly access your calendar while replying to an email. The robust calendar functionality allows you to manage your mobile communications while staying punctual. Create new meeting requests and use the scheduling assistant to make sure you find a time that works for everyone. Manage all of your documents in the cloud and attach them to emails directly from Box and Dropbox. Have an attachment that is too large? No problem, you can share these files with a private link directly to the document that can be accessed by your recipients. Easily filter emails based on Unread, Flagged, and Attachments to easily find the emails relevant to you. Quickly turn an email into an event or task for follow up later. Keep track of your tasks to stay productive. Create new tasks from emails, mark existing tasks as complete, or manage due dates while on the road. Easily enable or disable your OOF settings in the business app you know and love. Set up a time period and manage separate replies for internal and external messages. These robust controls allow you to manage your settings while on vacation. Enjoy better office email designed specifically for the iPad. 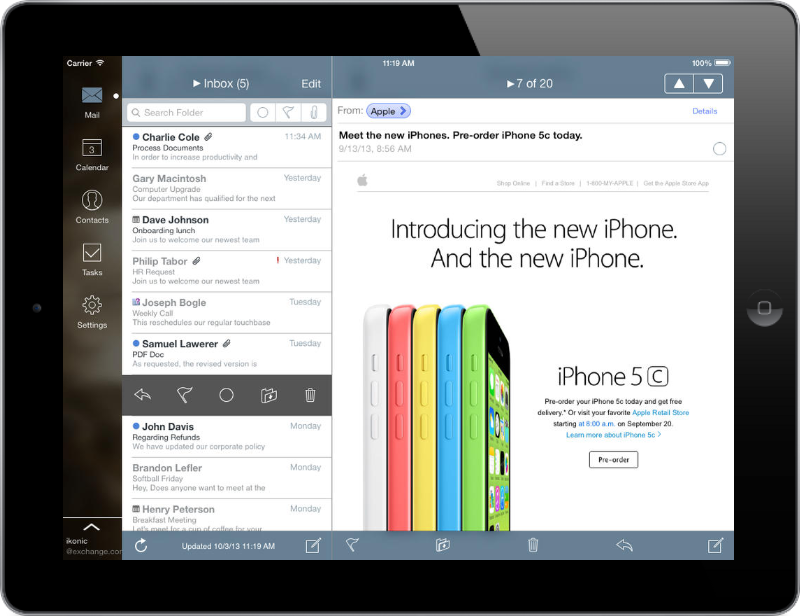 Buying Mail+ once gives you access to the app on all of your iOS devices. @mailplusapp #betterofficeemail using it for four years. Just started using the OOO and love it. Also like the calendar! @mailplusapp thanks for pushing updates to the app out so quickly. The app is fantastic. Okay, found a new App... @mailplusapp for iOS7, totally awesome for grabbing exchange server stuff. Clean & efficient. @mailplusapp Mail+ is great! Thanks for working so hard to constantly improve this terrific app! @mailplusapp Your app continues to be outstanding! THANK YOU! @mailplusapp Thanks for adding TouchID support! Securely checking my mail while I run from meeting to meeting is going to be 100% easier! @mailplusapp #betterofficeemail Allowed me to bag the BlackBerry! Attachments are a snap now! @mailplusapp very impressed over the last several updates. All my issues have been resolved. I am ready and excited about MailPlus 4.0. Copyright © 2014 by iKonic Apps LLC. Outlook and ActiveSync are registered trademarks of Microsoft Corporation. This application has been developed by a third party developer and is not endorsed, tested, or associated with Microsoft Corporation.